Lake Pleasant is about 4 miles long by 1 mile wide and surrounded by the majestic mountains of the Adirondack Park. 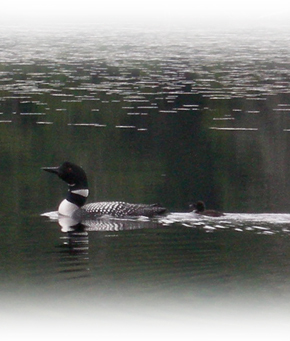 The lake is quiet enough to house the rarely seen loon, but also is motorboat-friendly. WatersEdge is located on the northwest shore near the Sacandaga outlet, a picturesque, winding waterway, popular with paddlers, that links Lake Pleasant to nearby "Little" Sacandaga Lake. Excellent fishing is available at Lake Pleasant, and the avid fisherman will also find the many streams and lakes within a few miles attractive for trout, bass, and walleye fishing! The Adirondack Park was created in 1892 by the State of New York amid concerns for the water and timber resources of the region. Today, the Park is the largest publicly protected area in the contiguous United States, greater in size than Yellowstone, Everglades, Glacier, and Grand Canyon National Park combined. The boundary of the Park encompasses approximately 6 million acres, nearly half of which belongs to all the people of New York State and is constitutionally protected to remain a “forever wild” forest preserve. The remaining half of the park is private land which includes settlements, farms, timber lands, businesses, homes, and camps. Read more about the park. Speculator has a well stocked grocery store which is open all year. Besides your grocery needs, they also carry local crafts, gifts and camping needs. Restaurants vary from fine dining at the Melody Lodge, to a sub shop and pizza shop with a local market for quick shopping and sandwiches. There are a number of shops in the area selling souvenirs and local crafts. The Speculator Department Store sells a full line of clothes and crafts from the area along with fishing equipment and camping equipment. The town also has a gas and convenience store, a laundromat, ice cream shops, a liquor store, a library, and an emergency care center. Lake Pleasant Marine & Boat Rentals is a full-service marina with boat rentals of various kinds. Camp of the Woods is a self-contained Christian religious retreat that sponsors many activities for children and adults. Services and weekly concerts and lectures by famous travelers and missionaries are available to the public with the purchase of a pass. The Adirondack Museum is located in Blue Mountain Lake, about a one hour drive from Lake Pleasant, explores the history of the Adirondacks through art and the artifacts of the region. It has a large shop containing Adirondack clothes, books, local crafts and souvenirs.